The Kats are proud to announce a special reissue of one of the finest AMT kits ever created: the 1959 Chevy El Camino! This marvelous model is being released in AMT's Original Art Series and features the beautiful AMT Street Rods packaging illustrations, circa the mid 1970s. This 2-in-1 customizing kit features two complete engines, multiple wheel options, custom and competition parts, gleaming chrome, pad-printed tires and more! Full-color customizing decals and an art print suitable for framing are included. It doesn't get much better than this! 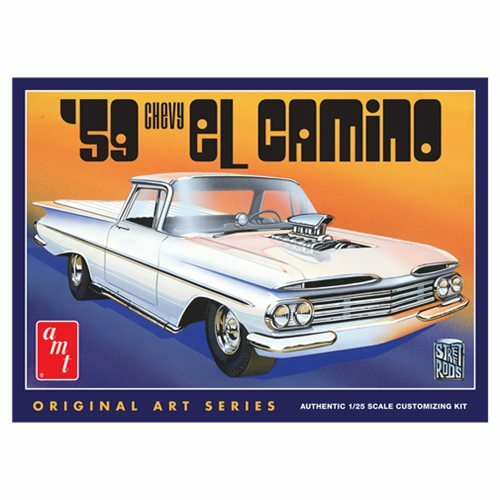 The 1959 Chevy El Camino 1:25 Scale Model Kit is a skill level 2 kit that requires paint and glue for assembly. Ages 10 and up.